This post is part 3 of a 3-part series based on data originally presented at the first Milwaukee Area Project conference. Part 1, overviews trends in population, employment, and wages since 1990. Part 2, on commuting and migrating in the Milwaukee area is available here. The Milwaukee region’s economy has undergone major shifts in the past quarter century. 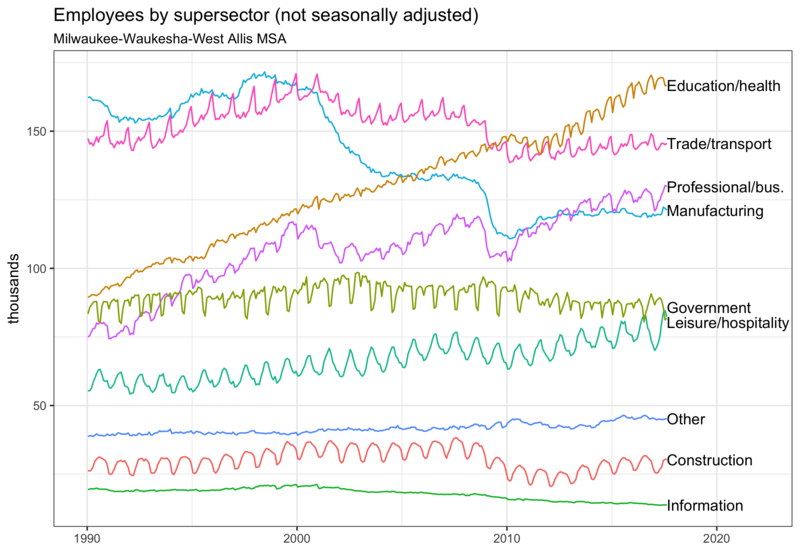 In the graph above, nearly all non-farm jobs in Milwaukee, Waukesha, Washington, and Ozaukee counties are grouped into one of the nine displayed “supersectors”. This data is gathered by the Bureau of Labor Statistics as part of its Quarterly Census of Employment and Wages (QCEW). The QCEW is a particularly good measure of labor trends because it is not simply a survey; it includes all businesses that participate in the federally mandated state unemployment insurance systems. Education and health is now the largest supersector—having enjoyed decades of nearly unbroken growth. Recessions have had little effect on its growth so far. Trade and transportation is second. This supersector closely mirrors the fortunes of the manufacturing industry, albeit with less extreme declines. Manufacturing jobs fell dramatically during the 2000s and again during the Great Recession. Since then it has remained largely stable. During the recover, Professional and businesses services surpassed it in share of total employment. These jobs are more effected by downturns in the business cycle than those in education and health, but they tend to recover more quickly than those in manufacturing or trade. Government employment (including federal, state, and local) has trended slightly down in recent years. The growing sector of leisure and hospitality is close to surpassing it. Construction has yet to recover fully from the 2008 collapse of the housing industry. Even in the best of times, however, it constitutes a relatively small portion of the region’s economy. Grouping many kinds of jobs into a handful of supersectors is useful for understanding some kinds of broad economic changes. But these categories also include broadly disparate jobs in terms of wages and experience required. 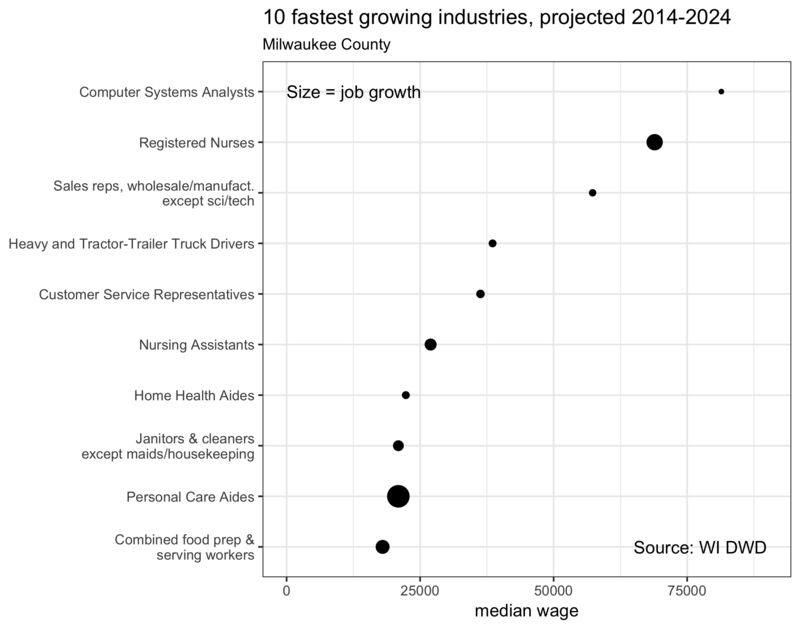 Above are the specific jobs likely to grow the fastest in Milwaukee county by 2024. These estimates were created by the Wisconsin Department of Workforce Development in 2014. Below is the same chart recreated for Waukesha, Ozaukee, and Washington counties. Both Milwaukee and the WOW counties are expected to add some high paying jobs. The ranks of registered nurses, computer systems analysts, and certain sales representatives are all expected to grow considerably. 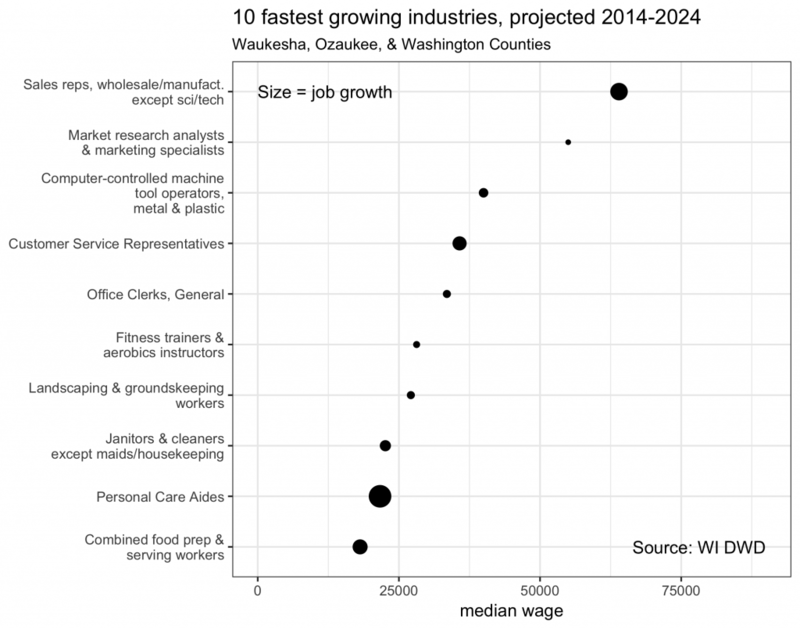 An average employee in each of these industries makes over $50,000 a year. However, even more jobs will likely be added at the lower-paying end of the spectrum. Due to the aging nature of our population, many of these will be in the caring professions—personal care aides, home health aides, nursing assistants, etc. None of these jobs pay well. An average employee will do well to make $25,000 annually. Food service workers will likely make even less. As discussed elsewhere, the Milwaukee area fails to attract many new migrants. Not counting international immigration, we have a net outflow of movers. Filling the needs of our labor market requires making good use of our own homegrown workforce. This means businesses across the region will likely look to Milwaukee to fill both low and high-paying jobs. Regarding the latter—the region’s largest colleges and universities are all located in Milwaukee. One of Milwaukee county’s most significant growing industries in the 21st century is higher education which has added close to 3,000 jobs since 2000. Milwaukee county will also likely provide much of the region’s future lower-wage laborers, if only because Milwaukee is where most of the future workforce lives. 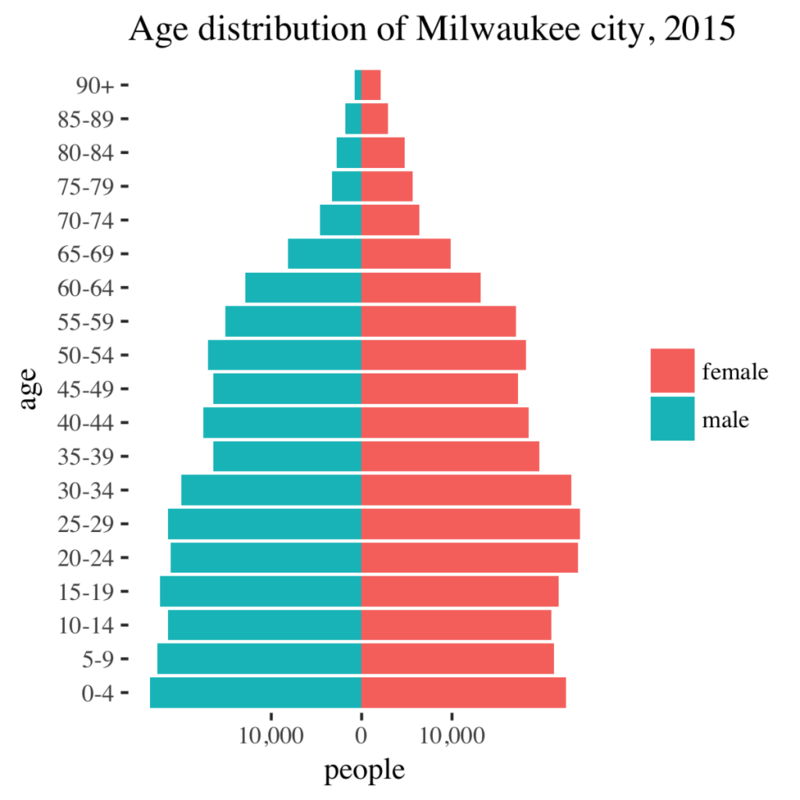 The population pyramids below show the age distributions of the populations of Milwaukee city and Waukesha county. The most populous four bars in Milwaukee are all under age 30. By comparison, the largest four bars in Waukesha county are ages 45 to 65. Waukesha’s workforce is aging out just as the bulk of Milwaukee’s population is entering its prime working years. A recent Marquette Law School Poll of the Milwaukee Area asked respondents about their satisfaction with their community and plans for the future. Overall, wealthy people were likely to say, “I’m happy here and will probably stay for the next five years.” This view was shared by 69 percent of those earning at least $75,000. Only 4 percent answered, “I’m unhappy here and will probably move in the next five years.” By comparison, only 37 percent of respondents from households earning fewer than $40,000 a year reported being happy and intending to stay. Twenty-one percent were unhappy and intended to leave “their community” within the next five years. The Milwaukee area’s economy continues to shift—in line with national trends—away from manufacturing and trades and toward a more service-based economy. Some of these jobs, such as nurses and high-tech workers, pay well. A few solidly middle-class jobs such as customer service representatives and advanced computer-based manufacturing continue to exhibit strong growth as well. Nonetheless, many of these new service-sector jobs pay poorly, and these low wages likely contribute to the desire of so many low-income area residents to leave their communities. Building a stable, prosperous future for the area will require not just making the region attractive to newcomers, but also improving the quality of life for people who already live here.